If you are hunting big fish around wrecks, rigs or artificial reefs, our stainless steel shooting line is what you need. We offer a variety of Stainless Steel Shooting Lines to cover virtually every application. Whether you're looking for 300lb or 480lb line, uncoated or coated, 7 x 7 standard strand wire or super flexible 7 x 19 wire, or Ultra Thin line that shoots and acts just line mono, we have you covered. Each package of shooting line comes in a 35 foot roll and includes 6 copper crimps. NOTE: Never use aluminum crimping sleeves on stainless steel cable. The chemical reaction will severely weaken both the cable and the crimps. Only use crimps made of copper. Smaller diameter than traditional stainless shooting lines and coated for better abrasion resistance. Ideal for smaller spearguns and shooting around structures. Shoots just like 300lb Mono and has 300lb breaking strength, yet thinner than traditional 300lb Mono shooting line. 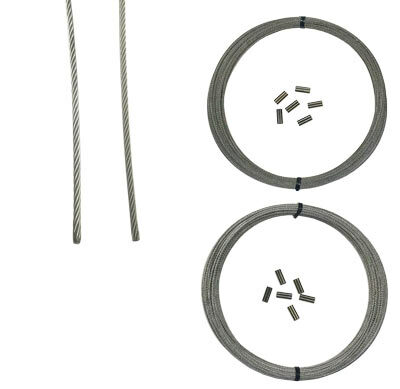 Specs: 3/64" cable diameter, 1/16" coated diameter, 7 x 7 strand configuration. Includes 35 feet of cable of line with (6) 1.6mm crimps. Big diameter cable and coated for better abrasion resistance when shooting around structures. Offers a 480lb breaking strength which is a must for big game hunting. 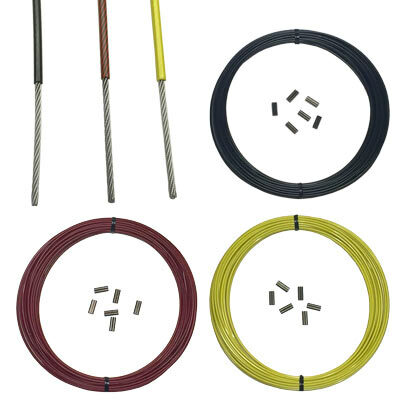 Specs: 1/16" cable diameter, 3/32" coated diameter, 7 x 7 strand configuration, available in yellow, red, and black. Includes 35 feet of cable with (6) 1.9mm crimps. Our big diameter Uncoated Stainless Steel Shooting Line is designed for offshore blue water hunting. It offers a 480lb breaking strength which is a must for big game hunting. Our Uncoated Shooting Line is available in both 7 x 7 and 7 x 19 strand configurations. The industry standard 7 x 7 strand configuration offers good performance and flexibility while our 7 x 19 strand configuration goes above and beyond industry standard offering superb performance and amazing flexibility which helps reduce any chance of the cable tangling or knotting. 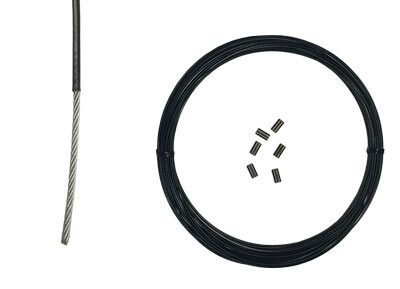 Specs: 1/16" cable diameter offered in both 7x7 and 7x19 strand configurations. Includes 35 of cable with (6) 1.9mm crimps. A must arround reefs or structure. I lost a huge black drum and learned my lesson.